The World March will begin in New Zealand on October 2, 2009, the anniversary of Gandhi’s birth, declared the “International Day of Nonviolence” by the United Nations. 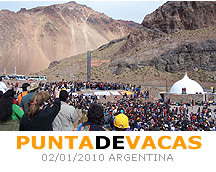 It will conclude in the Andes Mountains (Punta de Vacas, Aconcagua, Argentina) on January 2, 2010. The March will last 90 days, three long months of travel. It will pass through all climates and seasons, from the hot summer of the tropics and the deserts, to the winter of Siberia. The American and Asian stages will be the longest, both almost a month. A permanent base of a hundred people of different nationalities will complete the journey. Because eliminating wars and violence means leaving human pre-history behind and taking a giant step forward in the evolution of our species. Because in this aspiration we are accompanied by the strength of the voices of hundreds of prior generations who suffered the consequences of war, and whose echo continues to be heard today in all those places where it continues to leave its sinister trail of dead, disappeared, disabled, refugees and displaced. Because a “world without wars” is an image that opens the future and seeks to become reality in every corner of the planet, as violence gives way to dialogue. The March was initiated by “World Without Wars,” - an international organization launched by the Humanist Movement - that has been working for 15 years in the fields of pacifism and non-violence. That is why this is an invitation to anyone and everyone to participate freely. So that wherever the March goes, the local people can contribute their creativity in a great convergence of multiple activities. There’s space for everything the imagination is capable of conceiving. As it passes through cities there will be all kinds of forums, conferences and events (sporting, cultural, social, etc.) that will be organised according to the local initiatives that are emerging. non-aggression treaties among nations and the renunciation by governments of war as a way to resolve conflicts.